Good morning from Hamburg and welcome to our first Daily FX Report of this week. In the past six month, the USD dropped against 15 of its 16 major counterparts and last week, the USD continued its trend. We wish you like always a good start in the new trading week. The EUR gained versus the USD and JPY before European industrial reports forecast that they have positive signs for a recovery. That increases the demand for higher yielding assets for the euro zone. The EUR climbed to 134.31 against the JPY. The EUR reached versus the USD 1.4902. Furthermore the USD decreased against 12 of its 16 major counterparts. The USD increased to 90.13 versus the JPY. The USD dropped against 15 of its 16 major counterparts in the last half year as investors increased carry trades. They borrow money in countries with low interest rates and invest it in higher yielding assets. The NZD could rise to 0.7376 against the USD and versus the JPY, the NZD climbed to 66.21 after the world’s biggest dairy exporter plans to increase the prices for milk by 19%. The Benchmark interest rates in Japan are 0.1% and as low as zero in the U.S. In comparison, Australia has an interest rate of 3.5% and New Zealand has an interest rate of 2.5%. This is one reason that makes the JPY and the USD to favored targets for investors. Since the beginning of October, the EUR has been trading sideways against the AUD. 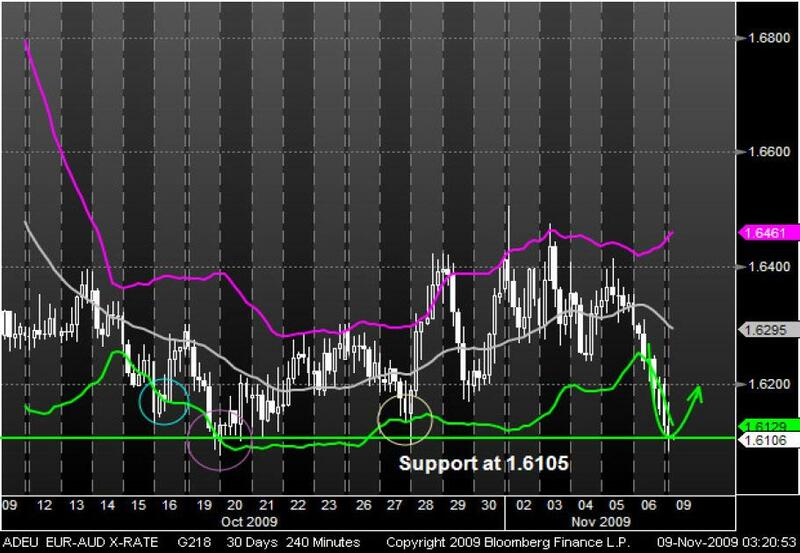 Recently, the currency pair fell to its support at around 1.6105. Furthermore it touches the bottom Bollinger Band with its current price. During the last three weeks, when the AUD touched the bottom line, the prices always recovered. Also during that time, the support was strong enough for a pull back, but it remain to be seen that the AUD could recover again. At the end of October, the AUD has been trading in a bearish trend channel against the CHF. Recently, the currency pair could leave its trend channel and crossed the upper line. 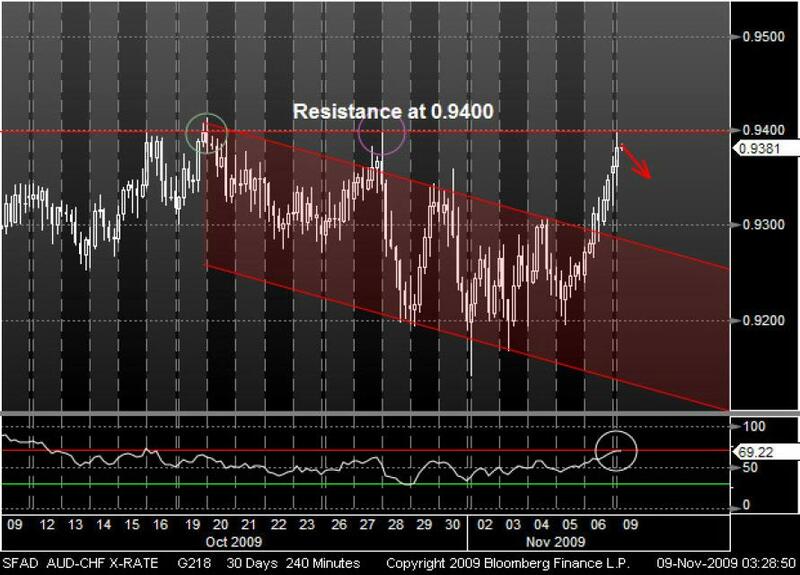 Now, the AUD touches its resistance of around 0.9400. When it reached its resistance, the prices rebounded two times in the past. Also the RSI may indicate a declining trend from its last upward movement.